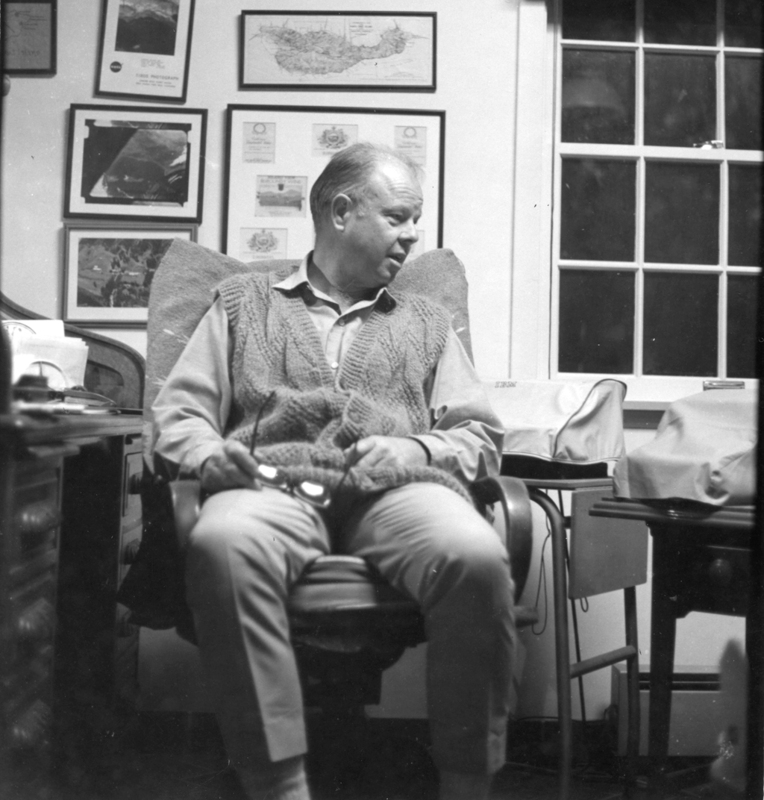 The Santa Cruz Island Foundation is a non-profit public benefit corporation established in 1985 by the late Carey Stanton to collect, maintain, and catalog items of real and personal property or interests regarding Santa Cruz Island and the other California Channel Islands, unique island environments off the coast of Southern California. 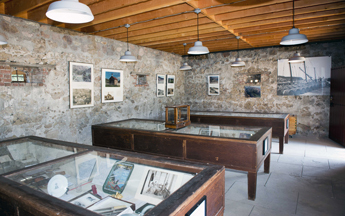 The Foundation displays for public benefit these items in cooperation with The Nature Conservancy, National Park Service and others as well as to promote research and publications dealing with historical aspects of the California Channel Islands. In addition, the Santa Cruz Island Foundation organizes and sponsors public exhibits and events dealing with the California Channel Islands, and organizes and sponsors educational trips. 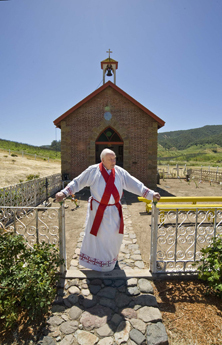 Of the eight California Channel Islands, Santa Cruz Island is the only one with a private chapel. In 1880 island owner Justinian Caire petitioned Bishop Francis Mora for permission to build a chapel on Santa Cruz Island. The request was granted, and in 1891, the Chapel of the Holy Cross was dedicated. The building, rectangular in shape, is of red island-fired brick, carved stone quoins decorating the corners, ogival portal and windows with a red-shingled roof and small belfry. Above the door is a large stone cross, quarried nearby and cut on sight. The iron railing separating the sanctuary from the nave is the work of an important Sicilian blacksmith. Colored-glass windows reflect on the interior walls. The gently vaulted blue ceiling is painted with more than 800 gold stars. A century of weathering and earthquake activity had compromised the chapel’s integrity. 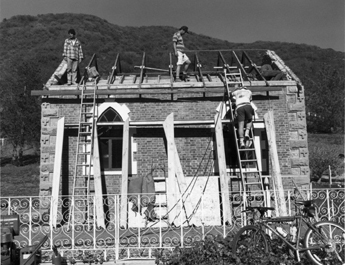 The Santa Cruz Island Foundation undertook a massive restoration project in time for the chapel’s centennial mass in 1991, celebrated by Timothy Cardinal Mahoney. Msgr. Francis J. Weber has served as Archivist for the California Mission system since 1962. 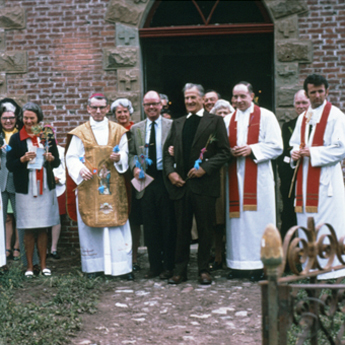 In 1968 Msgr. Weber requested permission from Dr. Carey Stanton to celebrate the island’s holy day, May 3, in the Chapel of the Holy Cross. Permission was granted, and thus began a tradition that has been perpetuated for since 1968; 20 years by Carey Stanton, and the ensuing years by the Santa Cruz Island Foundation in cooperation with The Nature Conservancy. Pietro “Pete” Olivari (1886-1961) began working on Santa Cruz Island in 1902 when he was 14 years old. From that year until the time of his death in 1961, Pete devoted his entire life to the island. He never married; he knew no other life. Pete lived in the board and bat Garden House, to the north of the ranch, much of this time. In 1989, Pete’s house was chosen as the appropriate location for an archaeology museum. 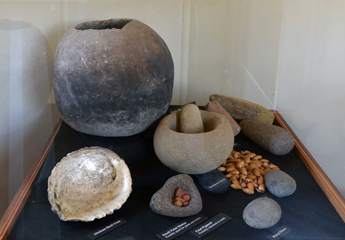 Chumash artifacts gathered on the island and guarded by both the Caire and Stanton families are on display. The Santa Barbara Museum of Natural History, Department of Anthropology was commissioned to design the museum, interpreting 13,000 years of years of Native American occupation. 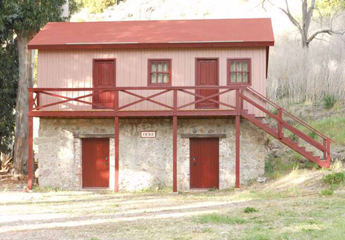 This Casa del Mayordomo is the oldest known building on Santa Cruz Island. 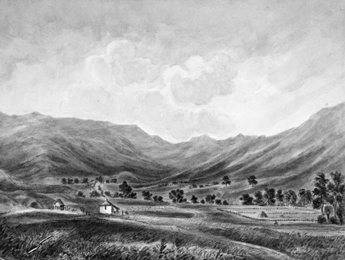 It appears in an 1855 watercolor by James Madison Alden and dates to the island’s ownership by Andres Castellero from 1839-1857. In about 1885, Justinian Caire added on to this adobe, turning it into the two story four-square house that it is today. In 1937 Edwin L. Stanton added an upstairs interior bathroom and inside staircase. The black iron banister was fashioned by the island’s resident blacksmith. Edwin Stanton’s son and island heir, Dr. Carey Stanton, was a bibliophile and collector of rare early-American furniture and silver. 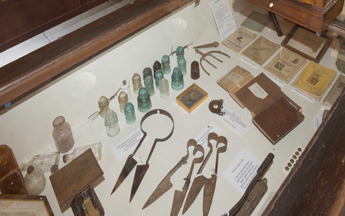 Today these collections, owned by the Santa Cruz Island Foundation, remain as Carey Stanton lived with them in the Justinian House. An original Wells Fargo desk occupies the Gun Room, along with the 19th century Caire French horn used to call the workers in from the vineyards, and the large spyglass used at the Prisoners’ Harbor lookout to search for passing ships. Dining room textiles are Fortuny fabrics. Original Audubon quadrupeds and the earliest known island maps hang on the walls. The Phoenix House was designed in 1950 by renowned architect, H. Roy Kelley (1893-1989) for Edwin L. Stanton (1893-1963), after a fire destroyed the Caire Family wooden Casa del Dueño or “owner’s house.” It is composed of a formal living room with inlaid teak floor, and two numbered bedrooms. Bedroom #1 was Evelyn Stanton’s and #2 was Edwin Stanton’s. The Phoenix House remains furnished with Stanton family treasures, now owned by the Santa Cruz Island Foundation. On the south-side of the Justinian and Phoenix houses is the office building with attached maid’s quarters (#6), and guest rooms #3, #4, and #5. Under Caire ownership, the office and maid’s quarters stood alone, first serving as a kitchen facility for the Main Ranch, and later, as an office. The Stanton’s purchased the island in 1937. 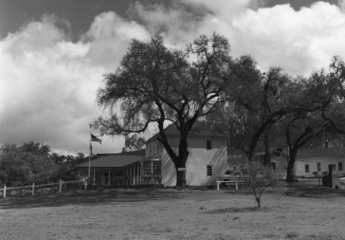 After the ranch fire of 1950, which resulted in the construction of the Phoenix House, two additional maid’s rooms were added as an easterly extension to the existing office and maid’s quarters. In 1957, when Carey Stanton moved to the island to live and work, he transformed the recently added maid’s rooms into two guest rooms. In 1959 Stanton added yet a third guest room, this the largest and nicest of the three. The nearby swimming pool and pergola were added in 1960. The hand-painted porcelain room numbers which identify the guest rooms as #3, #4, and #5, are Caire era plaques which once adorned rooms of the historic adobe at Prisoners’ Harbor. These three guest rooms are furnished as Carey Stanton designed them. 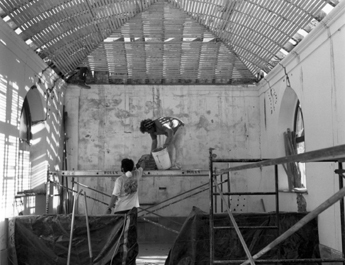 The contents are part of the collections of the Santa Cruz Island Foundation. In the early 1960s Carey Stanton purchased a barbed quatrefoil fountain from Lewis Antiques & Imports in Santa Barbara. This hand-painted tile fountain came from the Santa Ana Factory in Lisbon, Portugal. It was pre-assembled on a cement round for delivery and installation on the island. Some forty years later the fountain was in need of restoration. 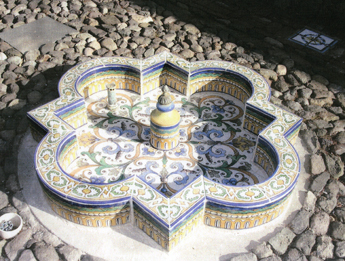 The Santa Cruz Island Foundation hired The Tile Studio of Santa Barbara to complete the task, and in 2005 the fountain became serviceable once again. Under Caire ownership, a full-time harness and saddle maker was employed to take care of the island’s many leather needs. Several 19th century island-made A-fork saddles lined with island woolskins are in the collection, along with the personal saddles of Fred Caire (1865-1950), Delphine Caire (1906-2000), and Justy Caire (1906-1987). Bronc, roping, and dude saddles include makers: Fred Mueller of Denver; N. Porter of Phoenix; Ray Holes of Grangeville, Idaho; Keystone Brothers of San Francisco; Litchenberger Ferguson of Los Angeles; Brydon Brothers of Los Angeles; and Jedlickas (work of John Schnell) of Santa Barbara. 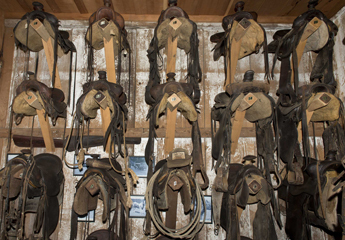 In addition, Stanton family saddles, including Edwin’s elephant-eared Australian saddle, Evelyn’s tooled western saddle, and Carey’s hand-sewed youth saddle and adult English saddle are preserved in the collection. 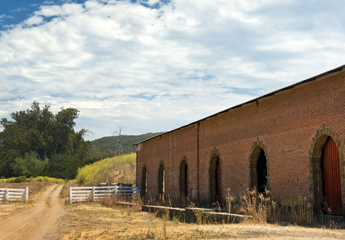 Two large island-fired brick winery buildings are located to the east of the Main Ranch complex. The upper building served as the crushing cellar and is undated. The lower building served as the fermenting cellar and is dated 1890. At the time of the ranch fire in 1950 the wood-shake roofs of both buildings caught fire, and the structures were gutted. 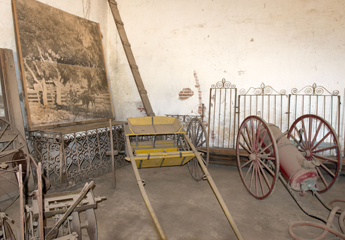 Much important island memorabilia was destroyed, including original wine-making equipment and island wagons and carts. After 1950 Ed Stanton had the walls cut down on both buildings, and they were reroofed with metal. 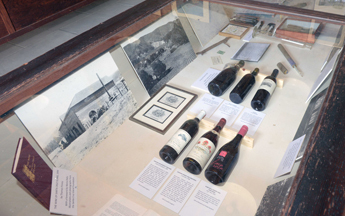 Today the eastern half of the fermenting cellar serves as a farm implement museum, and exhibit cases interpret the various eras of island ownership: from Andres Castellero (1837-1857) through Barron & Forbes (1857-1869); the Caire Era (1869-1937); and the Stanton Era (1937-1987). The single story redwood beekeeper’s house was elevated from ground level by Justinian Caire in 1890 to allow for the construction of La Cantina below it. La Cantina served as the island’s temporary wine cellar until the large brick wineries across the valley were completed, at which time it became La Cantina Vieja; The Old Winery. Through time and disuse, the upper wooden story became unstable, and was removed by the Stantons in the late 1950s. 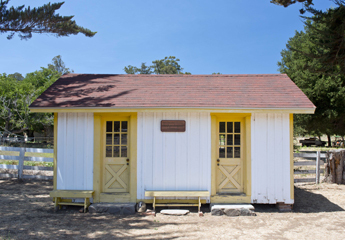 The beekeeper’s house was reconstructed between 2007 and 2012 by the Santa Cruz Island Foundation. For more than 25 years, the Santa Cruz Island Foundation has been organizing and funding quarterly maintenance at the Main Ranch. 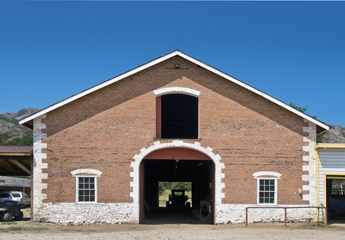 6-8 volunteers clean and maintain: Chapel, Cemetery, Cantina Vieja and Beekeeper’s House and surrounding areas; Pete’s House Archaeology Museum; Saddle Shop Museum; Lower Winery (east half).